The plaintiff, Janine Sugawara, says shes bought the Cap’N'Crunch with crunchberries because she thought crunchberries were real fruit. She subsequently learned that the “berries” were actually nothing more than brightly colored cereal balls, and that the cereal contained no real fruit. 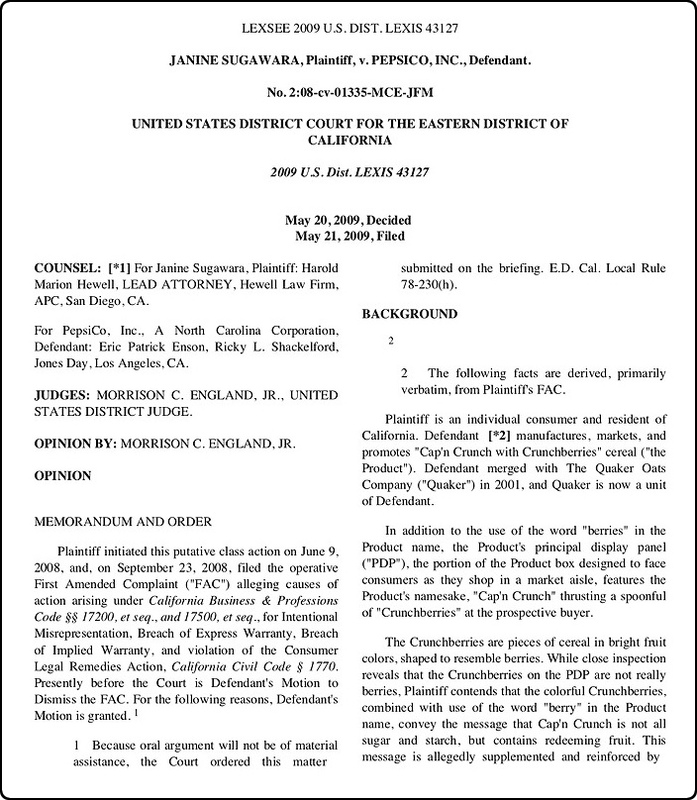 She sued on the grounds that the cereal advertised falsely. 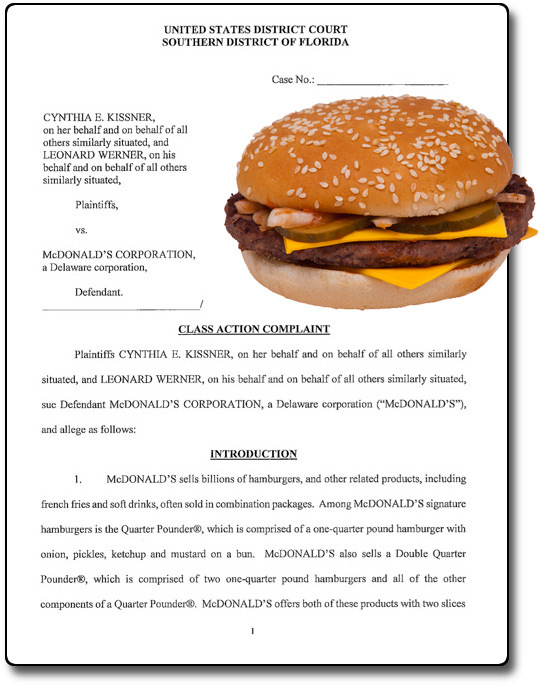 She reported that she was suing for herself, and every other consumer that had been “tricked” by the cereal company. 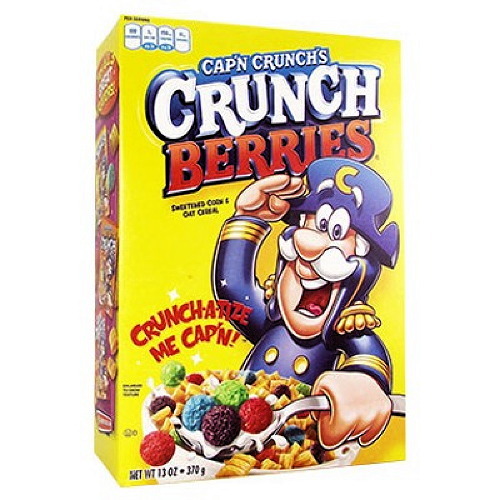 According to the complaint, Sugawara and other consumers were misled not only by the use of the word “berries” in the name, but also by an image on the front of the box, which features the product’s namesake, Cap’N'Crunch, aggressively “thrusting a spoonful of ‘Crunchberries’ at the prospective buyer.” The plaintiff brought claims for fraud, breach of warranty, and the California Unfair Competition Law and Consumer Legal Remedies Act. Long story short, the judge didn't buy her argument. 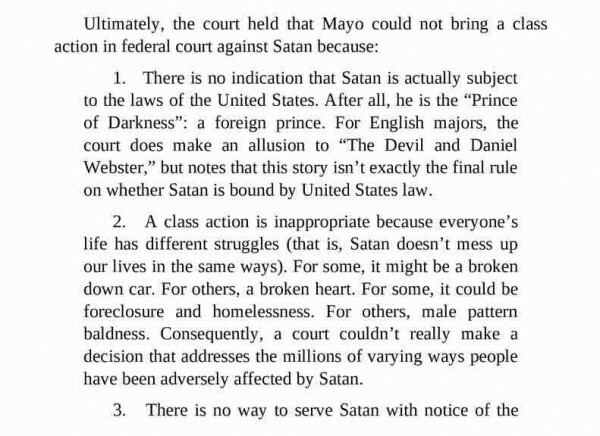 You can read the full decision here (pdf). "The mere fact that you're holding up McDonald's with a gun doesn't mean you give up your right to be protected from somebody who wants to shoot you." -Attorney for Timothy Ray Anderson who was shot by a security guard while robbing a McDonald's in 1991. 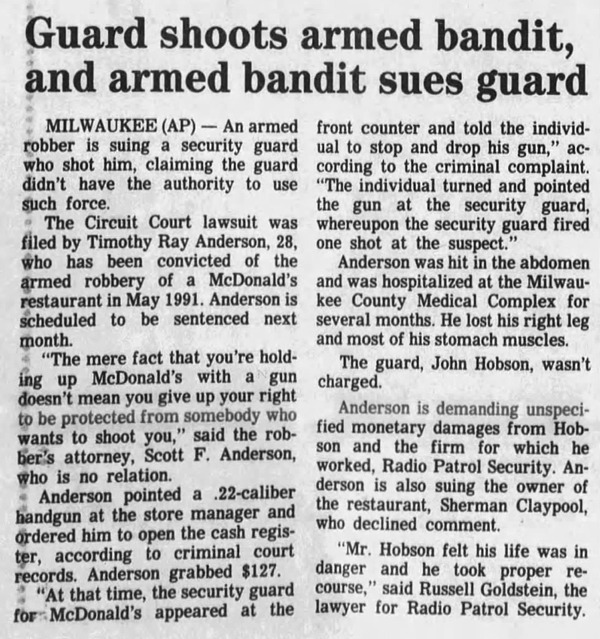 I'm curious to know what happened to Anderson's case, but haven't been able to find any follow-up about it. During the gasoline shortage of 1979, New York state ordered a $7 minimum purchase of gas at stations, to stop people topping up. 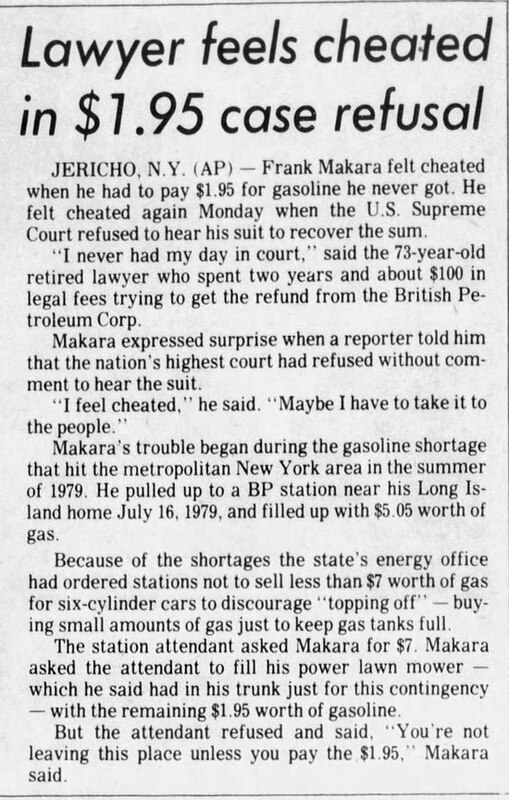 Frank Makara's tank would only hold $5.05 woth of gas, but he had to pay the full $7 minimum anyway. Outraged, he sued the BP station that charged him the $7, and took his suit all the way to the supreme court... which refused to hear the case. He ended up spending over $100 to try to recover $1.95. According to the online inflation calculator I ran the numbers through, $1.95 in 1979 has the same purchasing power as $7.18 in 2017. 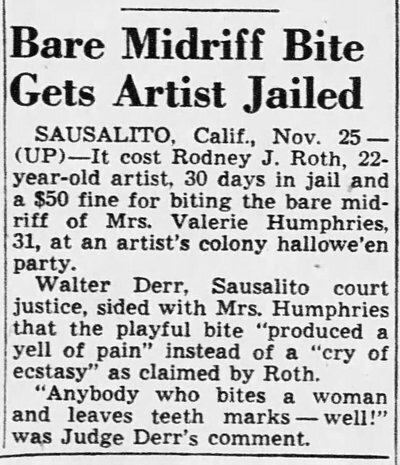 So, even in today's money, not worth going to court over. Unless you're a stubborn old goat for whom the principle is worth more than the money spent on court fees. On January 28, 1966, Erma Veith was driving along Highway 19 in Wisconsin when suddenly she veered out of her lane and sideswiped an oncoming truck driven by Phillip Breunig. 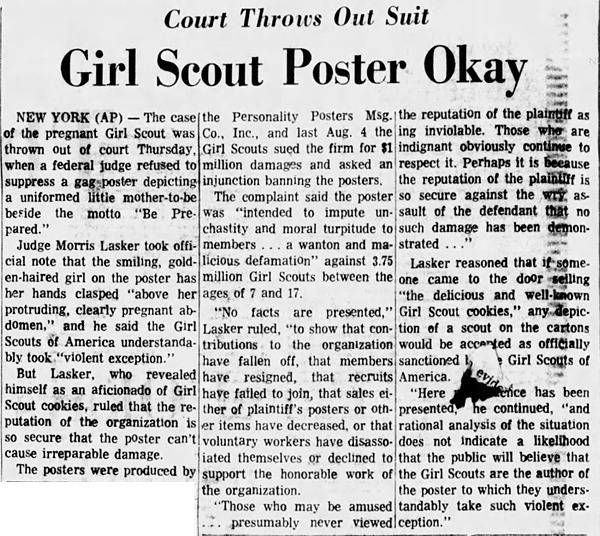 Breunig later sued for damages, but Mrs. Veith's insurance company offered an unusual defense. It said she wasn't negligent and therefore not liable because she had been overcome by a mental delusion moments before swerving out of her lane. 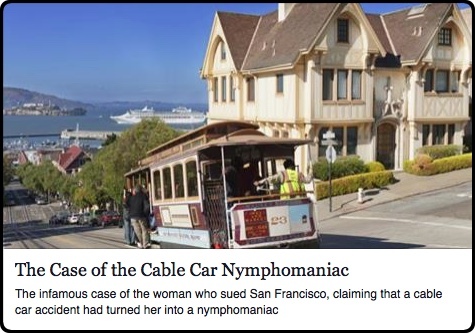 She hadn't been operating her automobile "with her conscious mind." 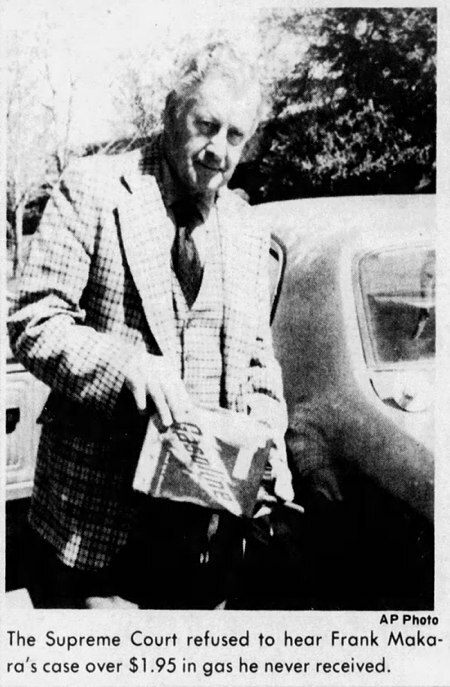 The psychiatrist testified Mrs. Veith told him she was driving on a road when she believed that God was taking ahold of the steering wheel and was directing her car. She saw the truck coming and stepped on the gas in order to become airborne because she knew she could fly because Batman does it. To her surprise she was not airborne before striking the truck but after the impact she was flying. Actually, Mrs. Veith's car continued west on Highway 19 for about a mile. The road was straight for this distance and then made a gradual turn to the right. At this turn her car left the road in a straight line, negotiated a deep ditch and came to rest in a cornfield. When a traffic officer came to the car to investigate the accident, he found Mrs. Veith sitting behind the wheel looking off into space. He could not get a statement of any kind from her. The court ultimately agreed with the insurance company that a sudden mental incapacity might excuse a person from the normal standard of negligence. It noted that a Canadian court had once reached a similar conclusion: "There, the court found no negligence when a truck driver was overcome by a sudden insane delusion that his truck was being operated by remote control of his employer and as a result he was in fact helpless to avert a collision." But the Wisconsin Supreme Court then ruled that this excuse didn't apply in Veith's case because she had had similar episodes before. Therefore, she should have reasonably concluded that she wasn't fit to drive. 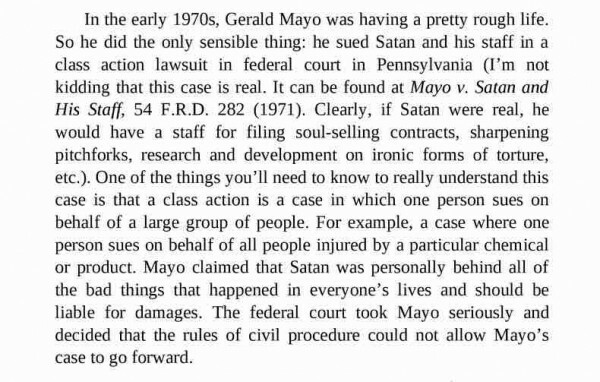 This case has become an important precedent in tort law, establishing the principle that you can't use sudden mental illness as an excuse if you have forewarning of your susceptibility to the condition. Entranced Erma Veith, so she later said. Of Erma's steering wheel, God took control. Erma now operated by divine compulsion. She hit the gas, so she'd become airborne. Why, Erma, would you seek elevation? 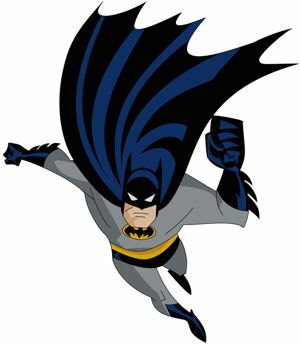 "Batman!" she replied, "my inspiration!" She had previously invoked the Duo Dynamic. "Batman is good; your father is demented." After all, mankind has long yearned for flight. Many have aspired to that satisfaction. 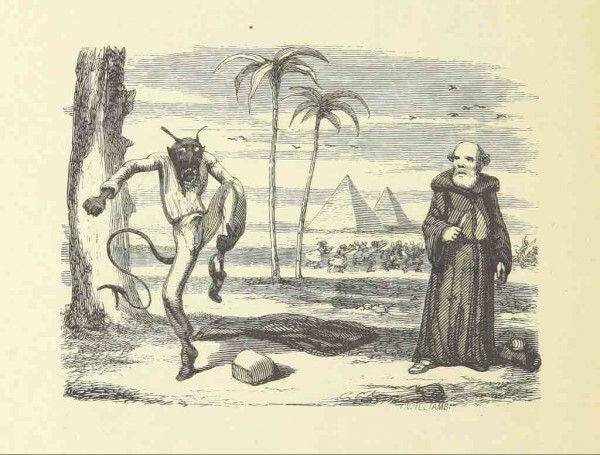 "Was Erma forewarned of her delusional state?" "She had known of her condition all along." When the end came, she would be in the Ark. Those to be saved, and those not devout. She might well expect, she'd suffer delusion. Erma was negligent, to drive a car. "Nothing can emulate the Batmobile!"